Cairns to Brisbane removalists can be a pleasant or a traumatic experience; it all depends on how you are planning to do it. Of course, you can move residence by yourself; find a truck to hire and gather a few packing boxes, then load all your furniture onto the truck and ask the driver to deliver it to your destination in Brisbane. However, if you are really smart, you will do none of this! Smart people will always hire an interstate moving company; a company that employs professional furniture removalists with years of experience! Cairns to Brisbane removalists is a team that comes armed with all the equipment necessary to help you move quickly, safely, and without any hassles. Roadways Furniture Removals – Helping You Relocate, Problem-free! Brisbane, in Queensland, is a wonderful city to live in. There’s the beautiful river, national parks and mountains around here, and Kangaroo Point that gives you fantastic views of the city. Life in Brisbane is nice and easy, and you should be excited about settling down here. Let not the thought of relocation mar your excitement. 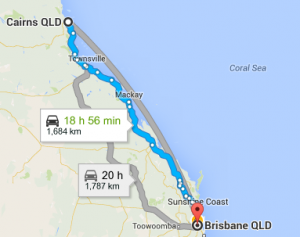 Leave the hassles of moving your household from Cairns to Brisbane to us! Roadways specializes in interstate removals in Australia. We employ the most knowledgeable and talented interstate removalists you can ever hope to find on Australian soil! Just give us a call, or shoot an email through. Once you employ our services, we will reach your premise with all the moving boxes, stickers, packing materials and other equipment required for pre-packing, backloading and furniture removals. Some of your furniture items may have to be dismantled. We can do this easily and will mark each item so that they can be assembled again easily once you have moved into your new home in Brisbane. Once everything is packed, we will move your items safely through the doorways and load them onto a truck that is waiting outside. We can even relocate delicate items such as the piano, antique furniture and paintings, which might have cost you a fortune. Interstate moving is easy with Roadways Furniture Removals as your Cairns to Brisbane removalists. Hundreds of customers have trusted us for our moving services, while many of them have even referred us to their family, friends and colleagues. Leave it to Roadways, because we deliver, always!